Nothing but love! 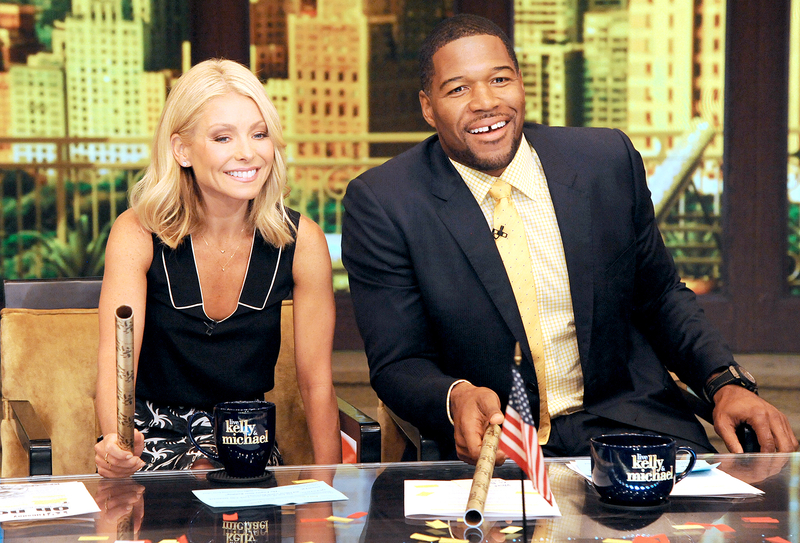 Michael Strahan gave a shout-out to Kelly Ripa on Good Morning America on Thursday, April 21, amid their ongoing behind-the-scenes drama over his unexpected Live With Kelly and Michael exit. "I&apos;m going to miss everybody at Live. I&apos;ve been sitting next to Kelly every day and having a lot of fun on that show the last four years. I&apos;m very thankful to her because I&apos;ve learned so much from her and Michael Gelman," Strahan, 44, told GMA cohosts Robin Roberts, George Stephanopoulos and Lara Spencer. "[They] showed me the ropes. I was so new to all of this and if it weren&apos;t for her and if it weren&apos;t for Michael Gelman and the staff there that really boosted me up and made me look a lot better than I really am, then I never would have had a chance to be here," he added, laughing. "I&apos;m grateful that I&apos;m here. We&apos;re on the same network. I&apos;m just right over here a little bit earlier now. But we are on the same team, the same family, the same network." Ripa, 45, has been absent from the show since the announcement. "[She] took a sick day. No way she was walking back into that today," a source told Us on Wednesday. A show rep added: "Kelly had today off from the show." As Us exclusively reported earlier this week, the TV personality — who took over for Kathie Lee Gifford on Live in 2002 — is jetting off on a preplanned vacation with her husband, Mark Consuelos. Actress Ana Gasteyer filled in for Ripa on Wednesday, and Erin Andrews will cohost Live with Strahan on Thursday and Friday. Despite the friction, Strahan is looking forward to the next chapter. "I&apos;m ready. I need some tips on how to wake up early every day. That&apos;s going to be first and foremost, but it&apos;s like my second family here," he said during GMA on Thursday. "I&apos;m excited to be here. I&apos;m excited to come here." Watch Strahan on GMA in the video above!